Simon Wickham-Smith, translator and friend of UMBS, has been busy with translations of Mongolian literature into English and developing the Center for Central Asian Literatures in Translation. 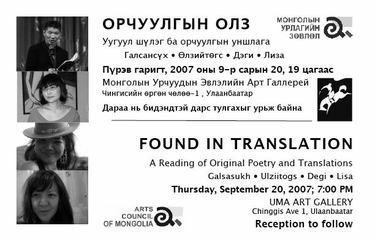 The Center's Web site currently features poetry, fiction, essays, literary non-fiction and folktales translated into English from Mongolia, Tuvan, Uzek and Old Turkic languages. From the site: "CCALT aims to provide high-quality English translations of various forms of literature from throughout the Central Asian region. In an effort to promote the availability and understanding of what has thus far been an underrepresented region, CCALT aims to make available, both online and in print, English editions of works from Kazakhstan, Kyrgyzstan, Mongolia, Tajikistan, Turkmenistan, Tuva, Uzbekistan and Xinjiang." CCALT's site also features a discussion forum that has yet to be utilized. There is also a posting guide for those of you who translate to submit your work to the site. Please check it out! Autumn became. Yellow leaves swirl around on the pavement. A strong cool wind blows. Though sun sets a little earlier each day, it still shines brightly. The white light illuminates every speck of sand and the sky is that immense Mongolian blue. I've got my cashmere on. Women are wearing stockings and leggings again. The foreigners have felt, wool and cashmere scarves wrapped around their necks. Mongolian women have their scarves wrapped around their middle. The temperature now dips to below 0º C (32º F) at night, and only reaches to around 15º C (60º F) during the day. I'm no longer counting down the days. I'm leaving with the falling of the leaves, and somehow this seems appropriate. As I go about meeting friends and colleagues one last time, I too am like a leaf swirling around on the pavement. My Mongolian teacher is obsessed with "lunner." He wouldn't let me rest until I promised to write about "lunner" on my blog. And when I told him I intended to get him a gift for all his help, he said the best gift would be that I post something about "lunner" on my blog. Thus, this one's for you, Munkh-Amgalan. Lunner is, you guessed it, a meal that takes place somewhere between lunch and dinner, a la "brunch." A late lunch. Or an early dinner, if you like. The word, as you can see, takes it's first syllable from lunch and it's second from dinner. Mu bagsh, as Munkh-Amgalan is affectionately known by his graduate students, is a linguist; we've spent a lot of time looking at the units, nature, structure, and modification of the Mongolian language and sometimes even of the English language. The man loves to create new words, and he's really pushing this one with tenacity. I find it a bit hard to force off my tongue, but a google search produces several instances of the use of "lunner" and it appears in a few eclectic dictionaries, such as the urbandictionary.com and thefreedictionary.com. The next time you forget to eat lunch and have to head out of the office in the middle of the afternoon, inform your colleagues that you'll be going out to lunner. Do it for Mu bagsh. My grant period as a Fulbright Fellow has come to an end. Now I'm a Fulbright alumna. Despite that, I know I've only just taken a few strides down this new road of literary translation. Nothing feels finished–that's a good thing, for me–and I have a vision for the future. I've been spending some time with another literary translator who is in Mongolia on holiday for a week from Korea. Stephen Epstein was raised in Boston but has spent fourteen years living in New Zealand as a professor at Victoria University of Wellington. The last seven of these years he has lived between New Zealand and Korea. It has been great to pick his brain on some practical issues of literary translation, particularly because the Korean language bears some important similarities to Mongolian in sentence structure and because he has a lot more experience with literary translation that I do. Stephen primarily translates short stories and novels. In Korea, he's involved with the Korea Literature Translation Institute, which, among many other activities, offers fellowships to translators of Korean literature who work in a variety of languages. His translation of Yang Gui-ja's Mosun (Contradictions) was recently published as part of the Cornell University's Cornell East Asia Series. I leave Mongolia in one week's time. Consequently, I am in the process of preparing to re-enter American society. Stephen and I had a good talk about this as he was in the US after a four-year absence to visit his parents this past summer. We considered the aspects of contemporary American culture that are so disheartening: the media, the emptiness of our culture of consumption, the blatant hypocrisy, our unfortunate blackened image across the globe, etc. Though I have more pride than ever in my homeland, that land's liabilities are ever more clear to me now.